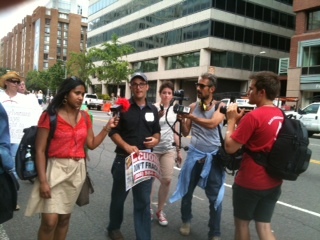 I may have been the 5000th protester, but I got to shake Josh Fox’s hand and thank him for keeping our tap water safe! For every person who made it to the Stop The Frack Attack! rally in Washington DC, many more were there in spirit. This movement is growing! “This issue’s not going away,” said filmmaker Fox, flanked by reporters on the march. Ecowatch.org has uploaded this amazing video by Sam Spear. The industrious folks at Marcellus Shale Protest have provided this list of links to live upstreamed video. Tour de Frack and Responsible Drilling Alliance have also provided excellent photos. Uploaded by Delaware Riverkeeper Network. A global day of action on September 22, 2012, to ban fracking in communities around the world! What Would You Tell President Obama? This entry was posted on July 29, 2012 at 1:40 pm and is filed under anti-fracking movement, Energy, Environment, fracking. You can follow any responses to this entry through the RSS 2.0 feed. You can leave a response, or trackback from your own site. Thanks to everyone who came! We worked hard to get this togehter and even though it was HOT! it was well worth the effort.